The Financial Times has reported that Rio Tinto, the Anglo-Australian mining conglomorate expects to deploy close to 100 per cent driverless trains by the end of 2018, which they believe are safer as well as being less costly to operate. Rio Tinto reported the inaugural operation of the unmanned freight train set just over four months ago. 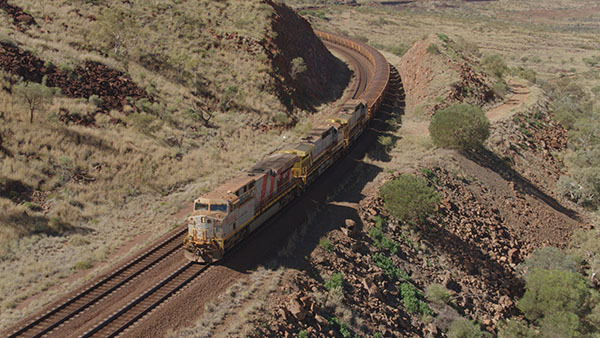 The first autonomous train, consisting of three locomotives and carrying around 28,000 tonnes of iron ore, travelled over 280 kilometres from Rio Tinto’s mining operations in Tom Price to the port of Cape Lambert on 10 July. It was monitored remotely by operators from Rio Tinto’s Operations Centre in Perth more than 1,500 kilometres away. The inaugural journey was a significant milestone for Rio Tinto’s AutoHaul™ programme. Rio Tinto Iron Ore managing director Rail, Port & Core Services Ivan Vella said “The safe first delivery of iron ore by an autonomous train is a key milestone for AutoHaul™. The programme will deliver the world’s first fully autonomous, long-distance, heavy-haul rail network, operating the world’s largest and longest robots. “This programme symbolises both the pioneering spirit and innovative talents of many people across Rio Tinto and shows our absolute commitment to improving safety and productivity, as well as enabling greater flexibility across our operations. “We will continue to ensure our autonomous trains operate safely under the wide range of conditions we experience in the Pilbara, where we record more than eight million kilometres of train travel each year.